Easter is a great time of year, with Easter egg hunts and lots of chocolate. It's also a serious religious time too, of course, but that doesn't mean you can't have a laugh, as these funny Easter quotes show. 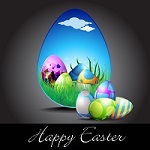 Enjoy them, and Happy Easter!